The synopsis sounded so interesting that I felt I might give this book a shot. And I’m so glad I made the choice to read it. Over the past one week, I have been smiling, laughing, smirking, nodding my head and ROFLing at every page. My 6-year old was wondering what has happened to me and was insisting that I explain the joke to her. As much as I attempted to give an explanation, unless and until someone had experienced the situation, he/she may not appreciate the context. 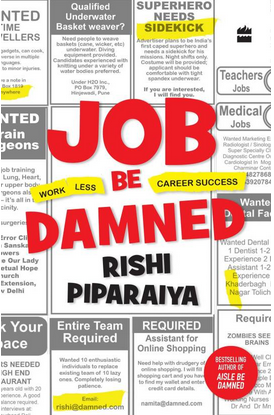 Having worked in MNCs and startups for more than a decade, Rishi Piparaiya's "Job be damned" reminded me of so many moments from my work life. Right from the interviews, orientation, navigating office politics, organization hierarchy, offsite events, appraisals, managing expectations etc, the author has covered it all. Humorous, funny, witty, sarcastic and actionable, he has recommended strategies that one could easily relate to. Underneath all the humor and fun, one cannot deny the fact that there lies some truth to the many issues. The powerful jargon, high-octane action verbs, one-liners and corporate mumbo-jumbo to be included in your CV, interviews, powerpoint presentations, goal setting process, meetings, appraisal reviews etc are all explained so beautifully. The chapters on the “holy trinity of work” - meetings, procrastination and CYA are so hilarious and outright funny. He must have attended so many meetings in order to come up with such precise understanding of how meetings work in any corporate organization. The tips on how to participate and get noticed, right from body language to expressions are well detailed. Another effective way to scuttle invites is to insist that some other folks from different departments attend as well. The convener will go crazy coordinating multiple schedules and the meeting will never take place. Completely fill up the room and if you are short of attendees, dress up the pantry boys in shirts and ties and pass them off as interns. Wave your hands passionately with fingers wide as you make an important point. Add on some head clucking movements, back and forth like a chicken, and you’ll surely receive the passionate Employee of the Month award. Hit the table hard a few times as you speak and it just got upgraded to Employee of the Year. As someone who has worked in middle management, I could relate to the chapters on managing perceptions with the team, managing expectations with the boss, managing emails and structuring presentations. The pages that talked about people who take smoking breaks with the boss and get insider information is just so so true. I only wish that the author has taken a stab at highlighting gender bias and the associated subtle issues prevailing in the industry. If you have ever worked in the corporate sector, you’d be able to relate and appreciate the various issues and the author’s proposed solutions. You might have been the victim or might have been the initiator of one or more of the strategies discussed. A total laugh riot from the first page to the end! I thoroughly enjoyed it. A good break from the kind of serious books that I usually read.